King Gorge V Memorial (KGVM) is an infirmary which is about seven decades old. It was set up in Mumbai to support economically disadvantaged patients admitted by police/social workers in Municipal hospitals. This not-for-profit is run by a cohort of Government bodies. High quality support services at the infirmary and its size and location (7.5 acres, opp. Mahalaxmi Race Course) distinguishes KGVM from other infirmaries. KGVM doesn’t accept walk in admissions. The patients are usually referred by hospitals run by Brihanmumbai Mahanagarpalika (K.E.M., Nair, and L.T.M.G Sion), police stations, social workers or other NGOs. The infirmary, at present has three wards – 2 for men and 1 for women. During their stay, patients are provided with all essential items plus some form of entertainment to keep their spirits high. The organisation is popular in Mumbai and is approached by several donors who donate in kind as well. Besides running an infirmary, KGVM also manages 10 joint projects with other NGOs serving different causes. The activities under these joint projects are carried out on the same campus where the infirmary is built. The projects cater to: children/orphans, young adults with impaired vision, children with hearing impairment, cancer patients and mentally challenged. Some of the partner NGOs are Bal Asha Trust, OM Creations, Akanksha, National Association for the Blind, Vatsalya Foundation. Providing Shelter plus Empowering Lives: The infirmary, currently provides shelter to 73 patients. KGVM offers placement with corporates/NGOs to individuals desirous to work off campus. About 10-12 patients visit Fellowship for Physically Handicapped at Worli everyday to work on stipend basis. Individuals, have even approached KGVM to hunt the hidden talent among the destitute and give them a platform to unleash their potential. There are patients who were selected to participate in plays, music shows etc. Different NGOs, Shrimad Rajchandra Love & Care, in particular, frequently visit the infirmary to teach yoga to patients, for physiotherapy sessions, head massage, play games, celebrate birthdays and simply spend quality time with patients to uplift their mood and spread positive energy in the environment. Total Income: KGVM earned a total income of Rs9.6mn during FY13, marginally lower than the income posted in FY12 (Rs10.6mn). Rs5.4mn i.e. 56% of total income in FY13 was earned by collecting service charges, a major revenue contributor in FY13. Other revenue contributors to KGVM’s FY13 total income were individual donations (15%), followed by income from Government Sources (13%). Service Charges: For KGVM, service charges include maintenance charges received from partner organisation (NGOs) with whom KGVM is running specific joint projects on the same campus. Currently, there are 10 other NGOs placed on the campus. Besides this, it also earns service charges on the coconut trees rooted in the vicinity. It is estimated that roughly 200 coconut trees are auctioned each year on campus with an annual yield of roughly 2,500 coconuts. Rs19,000/- is charged per annum to retail coconut vendors. Parking charges is another form of service charges that fetches KGVM some small amount of income. Other Income: Includes non-recurring income items like recovery of fees and prior period items in FY13. 7% of total income came from other income. It may be noted that in FY12, the contribution of income from this source was as high as 41%. This was because, during FY12, a huge amount of surplus was generated on redemption of mutual funds held with Asset Management Companies like the UTI and Tata. The total redemption amount was to the tune of Rs4.3mn. Programme & Overhead Costs: Rs2.7mn was incurred on direct programme expenses i.e. 49% of total expenses was spent directly on beneficiaries in FY13. The low percentage of spent on beneficiaries is a common trend observed among other NGOs running an infirmary/hospital. This is because NGOs, often are required to allocate significant amount of funds towards maintenance & repairs of the premises which is treated as an overhead item; thus increasing the overhead cost of an organisation. 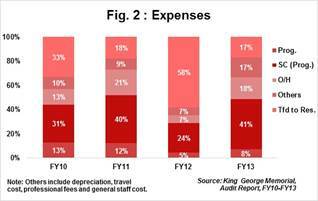 18% of total expenses was spent on overhead expenses. Salaries: Staff salaries were increased to meet the Minimum Wage Criteria laid down by the Government. It is because of this, salaries paid to staff during FY13 saw a hike of 28% from the immediate previous year. Salaries paid to staff increased from Rs1.8mn in FY12 to Rs2.3mn in FY13. The average tenure of an employee with KGVM is between 20 and 22 years. Professional Fees: During FY13, KGVM had appointed an advocate to take legal action against 10 ex-employees and their relatives who were unlawfully occupying the staff quarters. The suit was filed and the court announced verdict favoring KGVM. To manage the entire process of eviction of employees from the staff quarters, professional fees were paid to a lawyer, resulting in an exorbitant increase of 9x in professional fees in FY13. Earmarked Funds: This has witnessed a sharp increase from Rs4.3mn in FY12 to Rs7.5mn in FY13. The rise is on account of funds being allocated for meeting specific future requirements. Sources from the organisation indicated that these funds would largely be incurred towards repairs & maintenance of the property in the coming year. Amounts classified as ‘specific future utilization’ by KGVM include reserves created in FY12 (Rs4.3mn) and in FY13 (0.9mn). Investments: Investments had shot up by 22% in FY13 with Rs21mn as the closing balance on the Balance Sheet date. Roughly, 10% of total investments include Fixed Deposits created for Employee Provident Fund. Own Funds Build Up Ratio: The ratio is calculated by dividing Y-o-Y increase in own funds to increase in total funds in last three years. This ratio allows a donor to find out the accumulation of own funds in an organisation. The ratio for KGVM stood at 0.48, indicating that the organisation is not hoarding the donation amount collected from general public. In this case, higher ratio indicates more accumulation of own funds, which is not desirable. 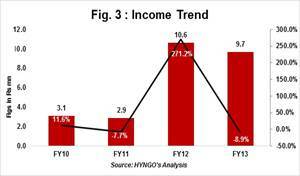 Income Growth Rate (IGR): KGVM posted a negative Y-o-Y total income growth of 9% in FY13. The fall in total income can be attributed to decline in a) interest income (27% in FY12 to 9% in FY13) and b) other income (41% in FY12 to 9% in FY13). It may also be noted that in past 4 years, the organisation has posted a 4-Year Income CAGR of 46% during FY10-FY13. The massive growth seen in FY12 (Refer Fig.3) is on account of amount realized on redemption of mutual funds and interest earned. Self Sufficiency Ratio (SSR): The ratio indicates capacity of an NGO to meet its operating expenses from its own income sources like interest income, service charges/membership fees, sale proceeds and individual donations. Own income excludes income sources like donations from government agencies, corporate houses or other not for profits. KVGM’s SSR improved considerably from 126% in FY12 to 163% in FY13. The improvement witnessed is owning to significant rise in service charges from 9% in FY12 to 56% in FY13. The average contribution of Service Charges to total income for past 4 years has been approx. 32%. The contribution from service charges is likely to rise in the subsequent years, because KGVM has recently revised service agreements with its partner- NGOs using KVGM’s campus. The organisation has definite revenue streams (service charges & donation from the government) sufficient to meet its operating expenses, suggesting healthy financial position of KGVM confirming longevity of the organisation. 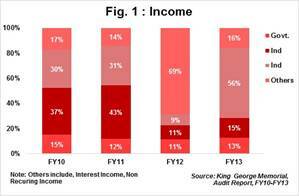 Dependence Ratio: It is impressive to note that KGVM has a diversified portfolio of income sources. Low dependency ratio indicates that an organisation is less vulnerable to financial erosion. The dependence on external income like individual donations was 15%, government donations was 13% and the balance from multiple sources of own income. Corpus to General Funds Ratio: This ratio gives us an idea about the proportion of perpetual long term funds in comparison to the general (unrestricted) funds available. It suggests whether the organisation is hoarding money simply by accumulating funds under corpus or is channelizing funds appropriately; equating funding requirements for long term survival with preparedness to meet near term funding requirements. The ideal ratio is 1:1, whereas KGVM maintains a ratio of 0.3, much lower than the desired level. Trust Corpus at the end of FY13 was Rs2.6mn; unchanged since FY11. It must be noted that since FY11, despite having earned surpluses in each year, KGVM had not transferred any portion towards building its Trust Corpus, whereas the general funds increased at a 3-Year CAGR of 27% during FY11-FY13. General Funds at the end of FY13 stood at Rs8.5mn, up by 57% from the immediate previous year. Raising funds for non programme related activities: Unlike other NGOs, KGVM has the luxury of space, donations and own income for its programmes. However, maintaining huge space spread across 7.5 acres in the prime location in Mumbai requires huge chunks of money. KGVM receives no donations from donors towards repairs and maintenance of the infirmary and therefore the place currently looks low-spirited, colorless with pests and dust bunnies all over. Composition of Management Committee: KGVM’s Managing Committee comprises 18 members which include 7 nominees appointed by the Governor of Maharashtra, 1 nominee appointed by the Government of Maharashtra, 3 co-opted by the Managing Committee and 7 nominated by the Municipal Corporation of Greater Mumbai. Each of these nominees have held senior positions as a civil officer, banker, lawyer, doctor or have been a part of the corporate world. None of the members are related to each other by blood or marriage. Committee Meetings & Member Participation: It may be noted that out of 18 members, 4 have never attended any meetings and another 4 attended only 1 out of 10 Management Committee meetings held during FY13. Nominees appointed by the Government of Maharashtra and Municipal Corporation of Greater Mumbai had shown least participation. Minutes of each meeting is documented and circulated to all appointed members of KGVM. Reporting Standards: KGVM publishes an Annual Report which is simple (no graphics) and short (max. 10 pages) but explains important details relevant to an organisation. It includes details about projects executed, names of donors with their contribution in cash and kind, number of beneficiaries, comments on financial parameters status on current litigations and revision in organizational policies, if any. As the organisation shelters patients only referred by sources mentioned above, documentation on each patient is kept minimal. Build other avenues of fund raising: Currently, the organisation receives external funding only from government agencies (13%) and the major chunk is raised through own income. To further strengthen their liquidity position, KGVM must consider reaching out to more donors, particularly corporate donors and non-government funding agencies. Accreditations: KGVM must consider getting itself accredited with authorized agencies which could bring additional credibility to KGVM. From an institutional donor’s perspective, accreditation in most cases have remained one of the key prerequisites to funding decisions and KGVM must take this into account while approaching institutional donors for donations. Engage Beneficiaries: Post our visit to KGVM, we feel that KGVM can utilize the time of patients better by engaging them in simple productive and enriching activities. By doing this, not only will KGVM empower patients but also boost their self-confidence and perhaps be able to divert their minds from sulking to taking life positively.